Caries is the single most common chronic childhood disease. If caries occurs before a child is 71 months old, it is referred to as early childhood caries. Nonpharmacologic behavior management techniques are primary techniques for treating children in the dental chair., Normally, fear of the dentist is fairly common in children, having been reported in 7% of children 4–11 years of age, while behavior-management problems have been found in 8%–11% of children when nonpharmacologic means were used alone.,, For them, pharmacological intervention (sedation or general anesthesia [GA]) becomes an important alternative for the dentist to adapt to manage dental anxiety, to help children cope with the stress of dental treatment and to avoid unpleasant and unproductive confrontation with the child. Alternative methods such as conscious sedation and other forms of sedation are also widely used. However, in some circumstances, conscious sedation may fail, and the use of GA becomes the only resource to provide dental treatment for children in a safe and effective way. 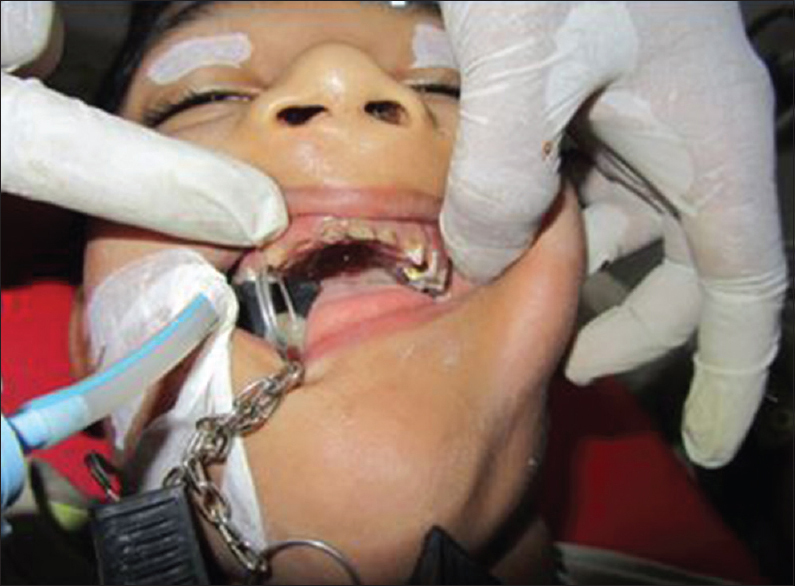 A 7-year-old male patient reported with parents to the pediatric dental clinic. 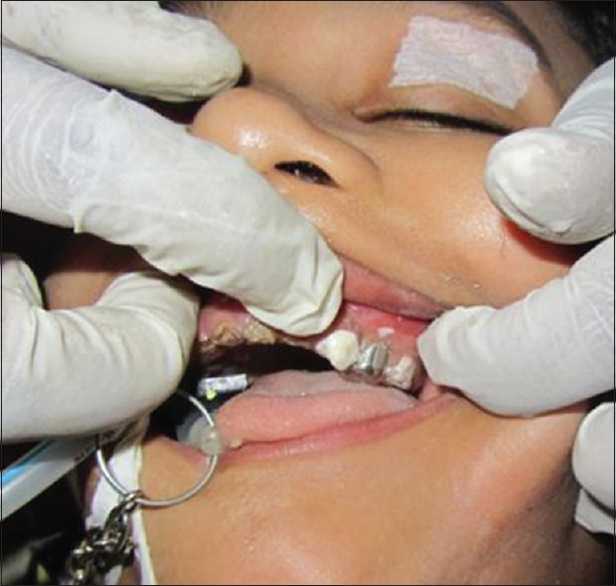 The parents reported that the child was having severe pain in most of the teeth in his mouth. As observed by the clinicians the child was inattentive. When asked to sit on the dental chair the patient ignored our commands. Even when it was tried to make him sit on mother's lap to show his teeth it was difficult. His mother then told that the child was a diagnosed case of ADHD for which they have been turned down by two dental surgeons to treat the child. Basic behavior-management techniques were tried initially on the child but had to be given up soon as the patient was not attentive. Considering the age of the patient, complexity of the treatment and the complications that may arise we gave the option of pharmacological means to the parents, i.e., sedation and GA. The mother who had an idea about GA as was told by the previous dentists who had refused to take up the case, told us to proceed with GA. The whole procedure was made to understand to the parents. The unique thing being we asked our anesthetist to give dental chairside GA.
After due appointment, the patient was admitted to hospital 1 day before the date of operation. Written consent was taken from the parents [Figure 1]. The parents were made clear regarding the oral status that whatsoever treatment is required will be done under GA as oral examination could not be completed in the initial visit. Premedication is the first stage of a general anesthetic. The goal of premedication is to have the patient arrive in the operating room in a calm, relaxed frame of mind. In this case, midazolam was given. The child was next ready to be intubated. Propofol was given intravenous for intubation. In addition to this injection of an opioid analgesic, fentanyl was given. Next nasal intubation was done to secure airway as endotracheal intubation would hamper the work to be done in the oral cavity. For maintenance of anesthesia, sevoflurane was administered. A thorough examination of the oral cavity revealed multiple decayed teeth in all four quadrants. It was decided to do quadrant dentistry, i.e., one quadrant at a time. As the treatment was being performed chairside, we had the advantage of providing highest quality work to the patient which is often not possible when the patient is being treated in operation table. We went on to provide pulpectomies and stainless steel crowns for posterior teeth (545564657585) which were damaged involving the pulp tissue [Figure 2] and [Figure 3]. The upper anterior teeth which were grossly decayed were extracted (51526162). Restorations for decayed teeth (536373837484). Bleeding from the sockets was controlled with pressure pack [Figure 4]. The patient was lost for follow-up as they shifted to America. Dental treatment under GA is an expensive alternative but on certain occasions the method of choice for treating unmanageable children. It is indicated for very young children who require extensive conservative dentistry and are unable to accept treatment in the dental chair, for children who are medically compromised, or for children who require oral surgical procedures. An important consideration for children who are unable to cooperate due to fear, anxiety, or young age is their subsequent acceptance of care using other methods with low risk and low impact. The aim of GA is to restore the child's oral health in a single visit, allowing behavior-modification methods to be introduced more readily afterward. It is for the general dentists as well as the pediatricians to know that children lacking co-operative abilities have to be rendered good oral care too. This increases the patient's quality of life. After the treatment, the child and the parents were very happy and satisfied regarding all functions of teeth, namely, mastication, speech, and cosmetic function. The general anesthesia can be provided as in patient after admitting the patient to the hospital or can be done as a day care surgery wherein the patient is treated chairside in the dental office. The daycare surgery protocol otherwise known as chairside general anesthesia in dental terminology has certain benefits. Apart from cost containment, other benefits of our patient's surgery are decompression of busy hospital beds, less nosocomial infections, and early recovery in home environment with the family. Thus, there is less disruption of personal lives. The added advantages for dental patients are the dentist is well acquainted with operatory so he can get the needed materials should the need arise, the patient appointments are lessened to a single visit, the co-operation level of child increases (the next time he visits a dentist), and also the patient does not have to wait for operating room availability. This was a unique case as it was managed in dental chair and there is a lack of scientific evidence for similar cases being done under chairside GA. This approach offers the advantage of providing extensive complete oral rehabilitation in a short period and a single visit, allowing immediate relief of pain, even with little or no cooperation from the child. However, it has little effect in promoting oral health and acceptance of routine dental care. Ismail AI, Sohn WA systematic review of clinical diagnostic criteria of early childhood caries. J Public Health Dent 1999;59:171-91. Ripa LW. Nursing caries: A comprehensive review. Pediatr Dent 1988;10:268-82. Low W, Tan S, Schwartz S. The effect of severe caries on the quality of life in young children. Pediatr Dent 1999;21:325-6. Klingberg G, Berggren U, Norén JG. Dental fear in an urban Swedish child population: Prevalence and concomitant factors. Community Dent Health 1994;11:208-14. Holst A, Crossner CG. Direct ratings of acceptance of dental treatment in Swedish children. Community Dent Oral Epidemiol 1987;15:258-63. Leelataweedwud P, Vann WF Jr. Adverse events and outcomes of conscious sedation for pediatric patients: Study of an oral sedation regimen. J Am Dent Assoc 2001;132:1531-9. Harrison MG, Roberts GJ. Comprehensive dental treatment of healthy and chronically sick children under intubation general anaesthesia during a 5-year period. Br Dent J 1998;184:503-6. 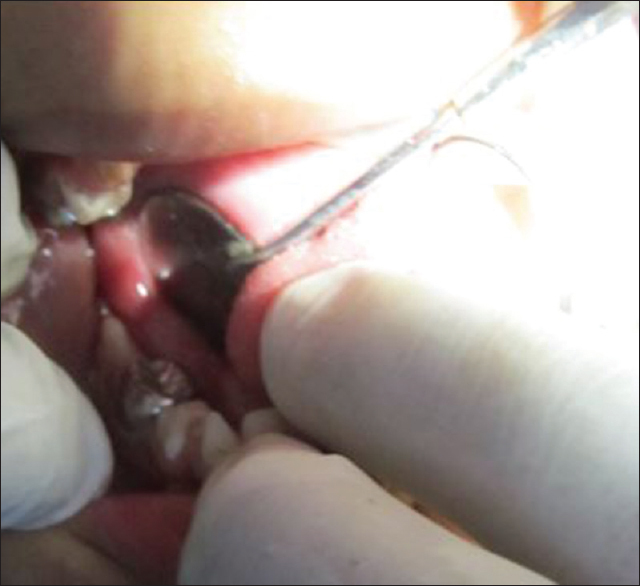 El-Bialy WB, Al-Rashid BA, El-Tanani H. Extraction of teeth under general anaesthesia for outpatient children and mentally retarded patients in Kuwait. Egypt Dent J 1992;4:257-62. Enger DJ, Mourino AP. 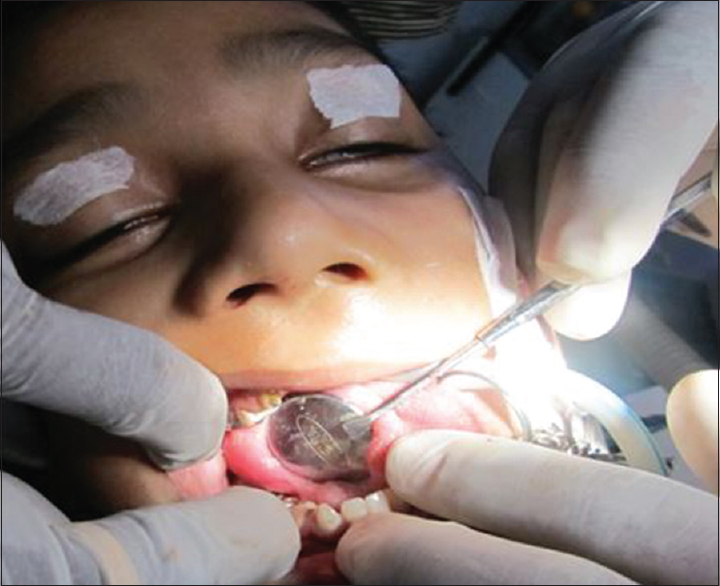 A survey of 200 paediatric dental general anesthesia cases. J Dent Child 1985;52:36-41. White H, Lee JY, Vann WF Jr. Parental evaluation of quality of life measures following pediatric dental treatment using general anesthesia. Anesth Prog 2003;50:105-10. Versloot J, Veerkamp JS, Hoogstraten J. Dental discomfort questionnaire for young children following full mouth rehabilitation under general anaesthesia: A follow-up report. Eur Arch Paediatr Dent 2006;7:126-9. Cahuana A, Reverón L, El Halabi L. Odontopediatríay anestesiageneral. Revis Casuística Arch Odontoestomatol 2003;19:240-4. Vargas Román Mdel P, Rodríguez Bermudo S, Machuca Portillo G. Dental treatment under general anesthesia: A useful procedure in the third millennium? (l). Med Oral 2003;8:129-35. Anderson HK, Drummond BK, Thomson WM. Changes in aspects of children's oral-health-related quality of life following dental treatment under general anaesthesia. Int J Paediatr Dent 2004;14:317-25.